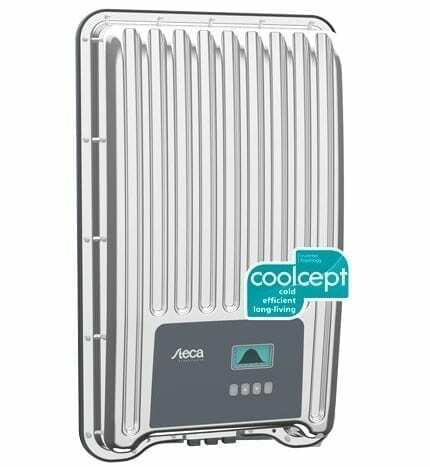 The Steca Coolcept-x StecaGrid 2000x 2kW Solar Inverter ` high efficiency results in a peak efficiency of 98.6 % and a European efficiency of up to 98.3 %, which results in less lost power that must be dissipated into the environment. This improves your yields. In addition to this, a new and unique cooling concept inside the inverter ensures an even distribution of the dissipated heat and a long service life for the device. The Steca Coolcept-x StecaGrid 2000x 2kW Solar Inverter has a graphical LCD display for visualising the energy yield values, current performance and operating parameters of the system. Its innovative menu allows individual selection of the various measurements. The guided, pre-programmed menu allows easy final commissioning of the device. The lightweights weigh only 11 kg, 11.5 kg and 12 kg and can be easily and safely mounted on a wall. The supplied wall bracket make mounting of the device simple and convenient. The device does not need to be opened for installation. All connections and the DC circuit breaker are externally accessible. The devices meet all the standards for the IP 65 protection class. Its robust stainless steel housing provides reliable protection against dust and water, including jet water. This enables problem-free installation of the inverters outdoors.